You will find below the horoscope of Emma Sjöberg with her interactive chart, an excerpt of her astrological portrait and her planetary dominants. If you know the time of birth of Emma Sjöberg, we would appreciate it if you would send us your information with your source, at stars@astrotheme.com. To thank you for contributing to the enhancement of our astrological database, we shall be glad to send you the astrological portrait (34 pages) of this celebrity. Horoscopes having the same aspect Mars trine Saturn (orb 0°21'): Marilyn Monroe, Natalie Portman, Leonardo da Vinci, Jennifer Lawrence, Coluche, Gwen Stefani, David Beckham, Joseph Stalin, Matt Damon, Denzel Washington, Michelangelo, Fyodor Dostoyevsky... Find all the celebrities having this aspect. Horoscopes having the same aspect Mars square Neptune (orb 0°35'): Britney Spears, Cristiano Ronaldo, Kylie Jenner, Demi Moore, Zac Efron, Alexander the Great, Andy Warhol, Barbra Streisand, Gary Oldman, Henry VIII of England, Dakota Johnson, Patti Smith... Find all the celebrities having this aspect. Celebrities born the same day: Niall Horan, Fiona Apple, Tyler Perry, Fabio Cannavaro, Jacqueline Bisset, Dave Mustaine, Sherwood Anderson, Roald Dahl, Stella McCartney, Cesare Borgia, Taryn Power, Swizz Beatz... List of all the celebrities born on September 13. Celebrities clicked on in real-time: 576,305,552 times. Emma Wiklund (née Sjöberg, born September 13, 1968, Stockholm, Sweden) is a Swedish fashion model and actress. She is a 177 cm (5 ft 9½ in) tall, blue-eyed, blonde who has walked the runway for Thierry Mugler, Christian Lacroix and Lanvin. She was signed to Elite Model Management and can be seen in George Michael's music video for Too Funky alongside other supermodels such as Linda Evangelista. She began her acting career in 1995, and with the four Taxi movies (1998–2007), she became a popular actress in France. In her native Sweden, she is known as a TV programme hostess and a regular in the fashion world. Here are some character traits from Emma Sjöberg's birth chart. This description is far from being comprehensive but it can shed light on his/her personality, which is still interesting for professional astrologers or astrology lovers. 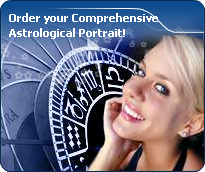 In a matter of minutes, you can get at your email address your astrological portrait (approximately 32 pages), a much more comprehensive report than this portrait of Emma Sjöberg. Warning: when the birth time is unknown, which is the case for Emma Sjöberg, a few paragraphs become irrelevant; distributions in hemispheres and quadrants are meaningless, so are dominant houses and houses' accentuations. Therefore, some chapters are removed from this part. Cheers for communication and mobility, Emma Sjöberg! The predominance of Air signs in your chart favours and amplifies your taste for relations and for all kinds of short trips, whether real (travels) or symbolic (new ideas, mind speculations). You gain in flexibility and adaptability what you lose in self-assertion or in pragmatism. Like the majority of Earth signs, Emma Sjöberg, you are efficient, concrete and not too emotional. What matters to you is what you see: you judge the tree by its fruits. Your ideas keep changing, words disappear, but actions and their consequences are visible and remain. Express your sensitivity, even if it means revealing your vulnerability. Emotions, energy and communication must not be neglected; concrete action is meaningless if it is not justified by your heart, your intellect or your enthusiasm. The Mutable mode is the most emphasized one in your natal chart, Emma Sjöberg, which indicates a mobile character that is curious and thirsty for new experiences and evolution. You are lively and flexible, and you like to react quickly to solicitations, but don't confuse mobility with agitation, since this is the danger with this configuration - and with you, stagnation is out of the question. Security doesn't matter as long as you are not bored. You optimize, you change things, you change yourself... all this in a speedy way. After this paragraph about dominant planets, of Emma Sjöberg, here are the character traits that you must read more carefully than the previous texts since they are very specific: the texts about dominant planets only give background information about the personality and remain quite general: they emphasize or, on the contrary, mitigate different particularities or facets of a personality. A human being is a complex whole and only bodies of texts can attempt to successfully figure out all the finer points. Emma Sjöberg, it is impossible to hide it: to love, to be loved and to please, all these activities are at the centre of your life. Because you loathe solitude, you are constantly looking for company, and if possible, for an amorous company. It does not mean that you are full of passion all the time: you are refined, delicate and charming and you skilfully make use of customs with moderation and balance, without losing sight of your personal interests. You are ready to adjust and to compromise in all circumstances. You want to love and to remain integrated in your society: love gives precedence to propriety, which is fundamental to you. You are particularly gifted for this game of refined courtesy and politeness where appearances are at least as important as contents; you are able to show what you feel like showing and you achieve your ends with elegance, gentleness and goodness. These are precisely your main assets. What an energy, Emma Sjöberg! You take so many initiatives, you have so much strength for action, construction and struggle! You are part of the conquerors, loyal and concerned about panache. Your vitality is such that you can achieve your objectives and release all your creativity. However, you are so proud and so unyielding that you cannot tolerate the faintest annoyance on your way: if you are vexed, you may turn into the opposite direction as a matter of reaction. Sexually, your magnetism and your energy work wonders. You are not complicated and, as long as your slightly domineering nature is respected and you are granted due admiration, all goes perfectly well. You usually have a lot of self-confidence and you believe in you. This characteristic feature may turn you into a hero with Hercules's strength and solar charisma. This text is only an excerpt from of Emma Sjöberg's portrait. We hope that it will arouse your curiosity, and that it will prompt you to deepen your knowledge of astrology, as well as to visit and use the wide range of free applications at www.astrotheme.com. Your Life Path is influenced by the number 1, Emma, which often prompts you to have an active and sometimes original life. 1 is the number of creativity and indicates individual destinies which are achieved at the cost of personal efforts because, although the path may lead very far, it climbs steeply upwards. You need to learn to manage your life with a strong willpower while using your own resources. It is most likely that you reach the best of your possibilities if you choose a free-lance occupation, or anything which allows a lot of personal initiatives. You really need freedom of action. You prefer to innovate rather than to follow the trend, and to create rather than limiting your activities to repetitive tasks. Thus, your life may be theatre of spectacular twists and turns, all the more so because the more you progress, the more your indecisiveness fades away. In such conditions, it is necessary that you strive to maintain a minimal degree of stability in the course of your life.